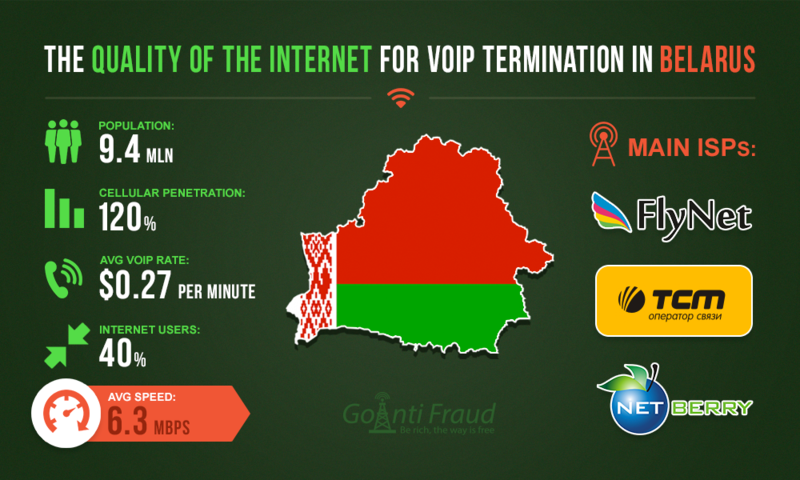 Belarus is an ambiguous country in terms of starting a VoIP GSM termination business. Buying a gsm gateway huawei, you must consider nuances such as reliable protection against antifraud systems, the right choice of locations for VoIP equipment, an efficient logic termination of calls. On the other hand, in the Republic of Belarus there are excellent opportunities for high profits because of the average rate value of $0.27, and an impressive amount of international traffic coming into the country. To obtain a stable income doing the call termination business in Belarus, it is also important to ensure the high quality of the Internet connection. You must provide 42 kilobits per second for one GSM channel. That is, the normal operation of the multi-channel VoIP equipment needs high speed Internet. The market of Internet services is quite well developed in Belarus. At the beginning of 2016, the total number of Internet users in the country reached more than 3.3 million people, accounting for about 40% of the population. According to the SecDev Corp. report, Belarus is among the top 3 countries, in which high speed Internet (1 Gbit/s) is available. The first and second places in the list belong to the United States and Sweden. Canada is ranked fourth after Belarus, providing the Internet at a speed of 940 megabits per second. Of course, access to such a high speed Internet is somewhat limited. The fact is that there are not enough servers that would be able to transmit data at this speed. That is, even if you have access to the Internet at speeds of 1 gigabit per second, you will not be able to use it in full. The limitation is the speed, at which other servers get information. In this regard, the superfast internet is most interesting for large companies, and it is used by a small number of private clients. Currently, Belarus lacks the massive demand for the service, although technologically local providers are able to provide it. Belarus was able to achieve leadership in the field of Internet technologies, on the part of the creation of high-speed networks, due to the fact that a lot of providers resorted to the Ethernet/xPON technology. Experts point out that in the near future, the Belarusians will be able to access the Internet at speed of 10-100 Gbps. In the meantime, the average speed of the Internet in the country is 6.3 Mbit/s, according to an Akamai Technologies second quarter of 2016 report. The average value of the ping in Belarus is 101 ms. Regarding average data rate, Belarus is inferior to other CIS countries. In Russia, for example, the figure is 12.1 Mbit/s in Ukraine - 12.3 Mbit/s, in Lithuania - 15.1 Mbit/s, in Latvia - 18.3 Mbit/s. However, this speed is suitable for the normal operation of GSM gateways to run the call termination business.